WWE is a weekly soap opera, whose sole purpose is to provide year-long entertainment to its fans. Throughout the year, WWE comes up with complex storylines, promos, and segments that lead to PPV matches, marking the end of feuds. Over the course of the past several decades, WWE has changed its content on several occasions. The product was made edgy in the mid-90s to cater to a new breed of fans, kick-starting the Attitude Era. After the Benoit tragedy, WWE steered towards a toned down product, complete with a PG rating. WWE has gone on to "kill" several Superstars for storyline progression in the past. Let's take a look at 3 instances when WWE Superstars "died" on Live TV in order to add more intrigue to the storyline and boost ratings. At The Great American Bash PPV in 2004, the main event was a handicap match pitting The Undertaker against The Dudley Boyz. A bizarre stipulation was set for the match by Paul Heyman, stating that he would bury Paul Beared under mounds of cement, if The Undertaker "didn't do the right thing". 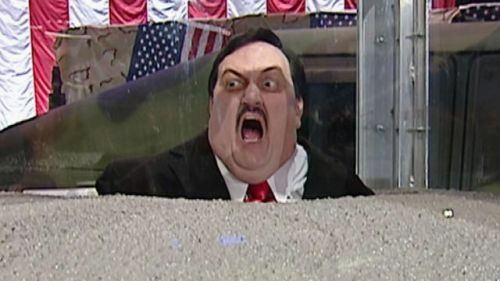 A cement truck was set up near the ramp, with Paul Bearer trapped inside a glass box, with an opening to fill it with cement. The Undertaker fought with everything he had, and went on to defeat the duo. This didn't sit well with Heyman, who threatened The Phenom that he'd bury his manager in cement. The Undertaker used one of his "magic powers", raining down a jolt of lightning on Heyman, who sprinted away from Taker in fear of his life. The Deadman finally bowed down in front of his mentor, Paul Bearer, and it seemed that the worst was over. This was far from the truth though, as The Undertaker proceeded to drop the lever down and "bury" Paul Bearer under tons of cement to end the PPV. Taker seemed to have turned heel at this moment, but the storyline didn't go anywhere and he immediately began feuding with JBL, leading to a WWE championship match at Summerslam.